Bagged logs, pellets and kindling are available for collection from “Firewood Services” which is open seven days a week. We supply firewood both in pellets from 6 mm length and log forms measuring up to 16" in bags. These bags are easy to handle for filling up your pellet stove or boiler, fuel storage or as a backup. We offer several types of order sizes which you can pick and choose from, or combine to suit your needs. "Bulk Bags" carry the equivalent of a face cord of wood, which comes in 12-14" lengths. "Backyard Burner" bags, which hold about a quarter of a face cord, are also available in reusable bags. Bush cords consisting of 16" length lengths and delivered as a tipped load in your driveway. 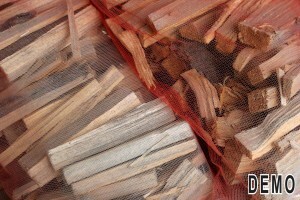 Small bags of kindling for fire starting, softwood or sawmill slabs. We employ hardworking staff that brings a personal and dedicated professional service to our Trade and to our customers. We use the most up to date firewood machinery which allows us to bring the finest cut logs for your home or place of business. Our logs are sourced from local woodlands; we pride ourselves on selling good quality logs at affordable prices. We have reserved lots of land for the storage and drying of our wood. We have been buying tractor trailer loads of logs to make certain that we always have a good selection of well and properly seasoned wood, all year long, for our customers. We bring in hardwoods that consist of maple, beech, yellow birch, cherry and oak. They are sorted and processed by species. We air dry our wood for a minimum of 12 months prior to delivering it to your location. We cut and split the firewood on our processor, then convey it right into clean, ventilated bags for curing.